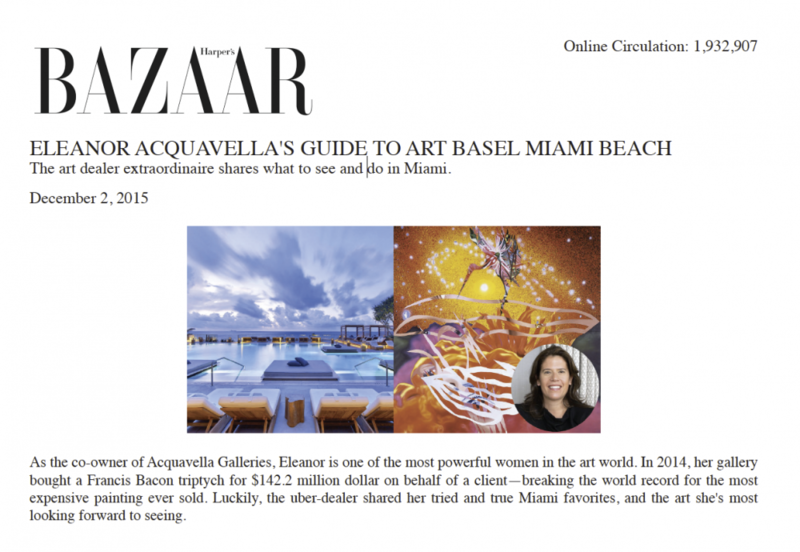 The art dealer extraordinarire shares what to see and do in Miami.As the co-owner of Acquavella Galleries, Eleanor is one of the most powerful women in the art world. In 2014, her gallery bought a Francis Bacon triptych for $142.2 million dollar on behalf of a client—breaking the world record for the most expensive painting ever sold. Luckily, the uber-dealer shared her tried and true Miami favorites, and the art she's most looking forward to seeing. I'm staying at the newly opened 1 Hotel in South Beach for the first time. It is an oceanfront hotel, which means I can wake up and take a long walk down the beach every morning for a dose of Vitamin D before heading to the convention center where I'll be in our booth all day. Their restaurant, Beachcraft is a collaboration between Tom Colicchio and Michael Fiorello featuring local fish and produce so we've planned a small dinner there for clients and friends on Tuesday night. Intimate dinners are in short supply in Miami for ABMB so I think it will be a nice chance for friends to gather without the glare of both flashbulbs and security guards. I look forward to visiting the Perez Art Museum (PAMM). I was excited to hear that Franklin Sirmans was appointed their new director, I've watched him closely from his time at LACMA and The Menil Collection. The Perez is a fantastic museum with a beautiful building and great programming. Their Beatriz Milhazes show last year was especially exciting since she is an artist I've collected for years and I was happy to be a lender to the exhibition. No matter how busy things are I always make time to visit my friend Patrick Seguin's booth at Design Miami. They showcase 20th century designers like Jean Royère, Charlotte Perriand, Pierre Jeanneret, Le Corbusier and my favorite Jean Prouvé. He always has amazing pieces and surprises, like the recreated axial portal frame house designed by Prouvé in 1938 and used during WWII. Every year I look forward to my friends Samantha Boardman and Aby Rosen's beautiful dinner at The Dutch. They always gather a fun crowd and The Dutch's chef Andrew Carmellini is really one of my favorites. The food is delicious and served family style so it's a relaxed way to get to know the great mix of people they always put together – it is not only great people watching with a veritable "who's who" of the ABMB scene but also filled old friends I've grown up with. The after party co-hosted by Vito Schnabel at the Wall is one of my rare nights out "clubbing" and is always a highlight. There is no place quite like Casa Tua in Miami. Set in a Mediterranean villa with lush gardens, the food is so simple and good. It is an excellent choice for a fun lunch or dinner with Trofie with Pesto alla Genovese. They also have a great wine list that makes it very easy to unwind after a hectic day at the fair. The nightclub upstairs is also a lot of fun - great music and it is a more intimate scale than most nightclubs so it's a great space to hunker down with friends and enjoy the energy of Miami. I plan on visiting the Rubell Collection to see their new exhibition "No Man's Land" that features 100 femaleartists including several site-specific installations that were commissioned especially for this show. I collect several of the artists on view including Marlene Dumas and Yayoi Kusama. I look forward to seeing the new dialogue and context that arises when so many exceptional pieces are side by side. I know I said I try and abstain the larger parties in Miami but my great friend Bob Colacello is hosting what I'm sure will be a very glamorous evening, so how could I say no to that? We work closely together at FAPE (Foundation for Art & Preservation in Embassies) for many years so I would do anything for him. He is co-hosting with Bonnie Clearwater and the dinner honors Douglas S. Cramer so it will undoubtedly be a huge success. Obviously I'm excited about the works that my gallery is bringing to the fair. In addition to exceptional rare works by de Kooning, Hesse, Riopelle and Picasso – we also have James Rosenquist, The Bird of Paradise Approaches the Hot Water Planet from 1988 which is one of the artist's most famous paintings. The palette, scale and subject matter are pretty dazzling. There is also a fantastic Gerhard Richter Horst and His Dog from 1965 that I am just crazy about. Stop by Art Basel Miami Beach and see it for yourself at Acquavella Galleries booth C4.